There’s a war going on, right under our noses. In our noses, perhaps- because it’s a war of nanotechnology, a war of brain infiltration. Sadie and Noah are caught right in the middle of the battle- plucked from their lives and plunged into the murky underworld where BZRK operates. They have been inducted to help with the battle. They may lose their lives or their sanity but one thing is for certain: BZRK will change their lives. For the worse. Michael Grant, of course, is the author of the critically acclaimed Gone series, and with a little embarrassment I must admit that I have never touched any of his books. Something I regret, having raced through BZRK with the speed of a needy heroin addict looking for his next fix. The difference being that I am addicted to Grant’s words, rather than some opiate. BZRK takes place in the near-future, where nanotechnology has become incredibly advanced and allows people to control tiny, microscopic things that can delve into anything- including the human brain. This technology can prove to be the unmaking of corporations and governments in the wrong hands, which is exactly where it is- in the hands of the conjoined Armstrong twins- who plan to create their own version of utopia on Earth. Except, of course, that their vision is not shared; a shady resistance group known as BZRK have equally powerful bio-technology. What ensues is minute warfare…and the battleground is the human brain. The novel starts with Noah- a British teenager- visiting his brother at the “East London Hospital for the Treatment of Serious Mental Illnesses”. His brother- Alex- is a crazy wreck of a human being, his insanity unnatural and an unexpected turn of events for a soldier whom Noah knew to be incredible calm and controlled. The only words Alex lets out are “nano”, “Bug Man” and “Berserk”. Thus begins BZRK– skipping from character to character to tell a story the likes of which have never been seen before, at least not in this way. Grant, I am told, has a bit of a reputation for writing novels with a cart-load of main characters. And love it or hate it, BZRK doesn’t break this trend, maintaining at least eight or nine main characters and jumping from perspective to perspective to tell the story. Which is alright- at least, once you’ve sunken your teeth into BZRK– and only help to enrich the reading experience. The characters themselves are marvellous- an odd lot of urbanised teenagers and shady underworld personalities you can’t help but be fascinated by. Each and every one has a story to tell, and they feel completely authentic. In fact, it is this characterisation which moves BZRK beyond being just a mere thriller. There is a quote on the reverse side of the novel in which Grant says “You may think you know what to expect. You don’t.” In that he is completely right- BZRK is unlike anything I have ever read, seen, heard or thought of- which makes it a powerful and unpredictable read that leaves you winded in awe once you finish the last sentence. What is most surprising about BZRK is not the gritty-realistic plot or the characters, but Grant’s prose. As someone unacquainted with his writing style, I found it startling to find such a crafted narrative- where every word and every sentence affects the reading, not in a way that bogged it down but a way that teased meaning and understanding of both the characters and plot. 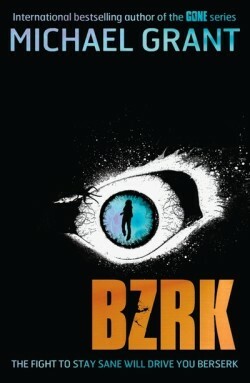 BZRK is not an easy read in that you can simply half-look at the words and get the gist of the story, but it is a highly complex, delightfully crafted, edge-of-your-seat thriller that explores the uncharted territories of nanotechnology. BZRK is the start of a remarkable new series that will have authors wishing they were Michael Grant- a truly extraordinary novel that won’t let you go until you’ve finished it- and even then, you’ll struggle to absorb the sheer delight of it all.